Series of mirrors in various shapes and sizes characterised by big coloured frames, available in the range of the transparent coloured glasses and glossy coloured diffusor glasses. Thanks to a special manufacturing, the mirroring surface and the transparent coloured frame are obtained just from one single slab of laminated glass. 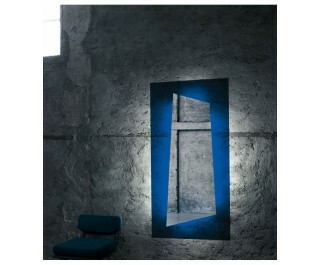 A lighting system placed on the back of the mirror enhances the frame and exalts its chromatic effect. Also available without lighting system. Glas Italia was established in 1970 in Macherio in Brianza, the industrious area of Regione Lombardia made famous by the shrewdness of some enlightened entrepreneurs of furnishings, thanks to whom the phenomenon of the "Italian design", well-known and appreciated throughout the whole world, could develop. The openness to innovation combined with a due respect for the severe quality principles, typical of the great Lombard industrial tradition, have enabled Glas Italia to realize in a gradual progression a variety of products for the house, the office and the contract which give evidence of an authentic passion for the glass manufacturing, making the best of the heritage of experience of the family old glass factory, founded at the beginning of the last century. In the designing process of mirrors, furniture, accessories, shelves, bookcases, tables and low tables Glas Italia avails itself of the collaboration of renowned designers who - experimenting in full freedom on the technologically advanced productive plants made available by the Company - can express their creative talent, pointing out the inexhaustible potentialities of such a pure, noble and refined material as glass. From the profitable synergy between Company and designers a collection of products has arisen which is characterized by innovative design and inner quality, as well as by a wideness of range fulfilling the requirements, the aesthetic sense and the contemporary taste of a broad array of international customers.